Law Makers have addressed the assisted suicide bill for the last four years and this year the bill is making progress in Annapolis. Some think this is a slippery slope we are heading down; others think it's the right path for those terminally ill. “This is a very emotional and personal decision,” said Delegate Shane Pendergrass, the sponsor of the bill, about the debate that carried a lot of emotion and personal experiences. 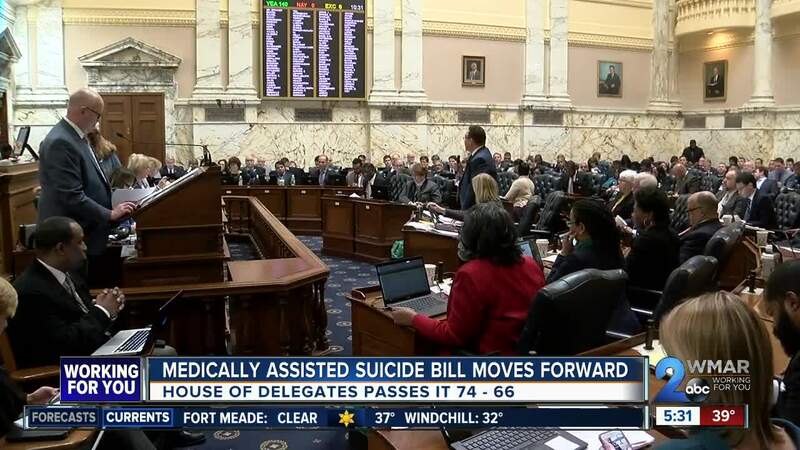 “Suicide is a crisis today and what I'm saying to you is with this bill we just make the situation worse,” said Delegate Christopher Adams, a Republican who represents communities on the Eastern Shore. ANNAPOLIS, Md. — Lawmakers have addressed the assisted suicide bill for the last four years, and this year the bill is making progress in Annapolis. Some think this is a slippery slope we are heading down; others think it's the right path for those who are terminally ill.
“This is a very emotional and personal decision,” said Delegate Shane Pendergrass, the sponsor of the bill, about the debate that carried a lot of emotion and personal experiences. “Suicide is a crisis today, and what I'm saying to you is with this bill we just make the situation worse,” said Del. Christopher Adams, a Republican who represents communities on the Eastern Shore. The bill would allow a terminally ill patient with a diagnoses of six months or fewer to live to get a prescription from a doctor to end their own life. "The conversation about those options are with the attending physician and with the individual,” said Del. Joseline Pena-Melnyk, a Democrat representing District 21. Del. Cheryl Glenn spoke of a women she knew that was dying, saying she would have taken her own life if the option was there. That women's estranged son, who she had not seen for quite some time, made it back in time to see her one more time. “But she would have left this world without making peace with her only son. And that was good for her and that was good for him. He needed that and she needed that,” Glenn said. Kim Callinan is the CEO of Compassionate Choices and has dealt with doctor assisted suicide in many states. “I think there is a much greater awareness of the importance of assuring that we recognize that this is about putting the patient in control of the process,” Callinan said. Delegate Nicholaus Kipke, an Anne Arundel County Republican, is concerned that terminal patients that don't have access to quality medical insurance may be forced to use suicide as a solution. “My fear is that in certain communities they may be more inclined to do this because they don't have access to the aid that they need at the end of their life,” Kipke said. The bill passed the house 74 to 66. This is the farthest the medical assisted suicide bill has gone.